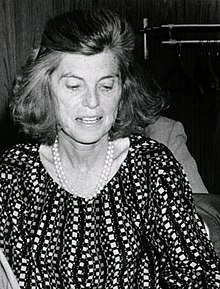 Eunice Mary Kennedy Shriver, DSG (July 10, 1921 – August 11, 2009) was a member of the Kennedy family, sister of President John F. Kennedy and Senators Robert F. Kennedy and Ted Kennedy. Kennedy was born on July 10, 1921 in Brookline, Massachusetts to Joseph P. Kennedy, Sr. and to Rose Fitzgerald Kennedy. She studied at Manhattanville College and at Stanford University. Kennedy was married to Sargent Shriver from 1953 until her death in 2009. They had five children. Shriver died on August 11, 2009 in Hyannis, Massachusetts after having a stroke, aged 88. Her husband, Sargent Shriver died on January 18, 2011 in Bethesda, Maryland. ↑ Smith, J.Y. (August 11, 2009). "Eunice Kennedy Shriver, Founder of Special Olympics, Dies at 88" The Washington Post. Retrieved August 11, 2009. Wikimedia Commons has media related to Eunice Kennedy Shriver. This page was last changed on 31 August 2017, at 01:20.